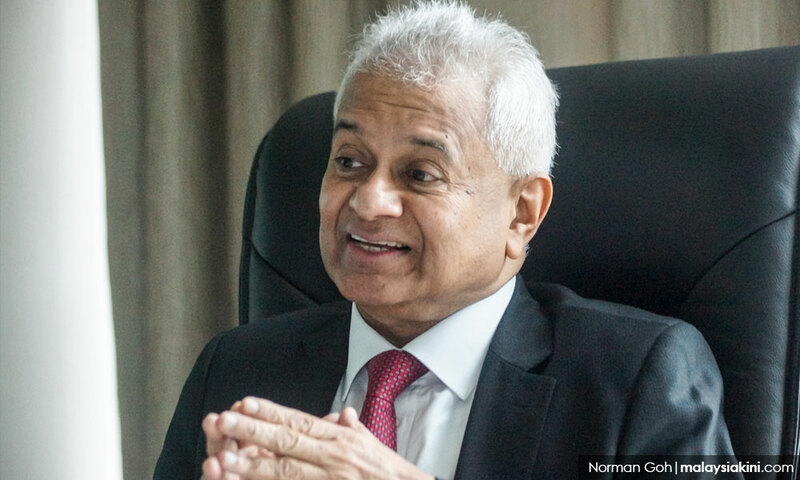 LETTER | Tommy Thomas’ recent interview with Malaysiakini and The Edge was enlightening and should put to rest many of the criticisms levelled against the new attorney-general. Thomas’ decision to outsource the prosecution of Najib Tun Razak, the 1MDB and the Equanimity cases to experts in the various legal fields is the best way to deal with complicated and time-consuming cases that need expertise and specialisation to win the case for the government. It must be noted that many high -profile cases were lost because of the prosecution service not being up to the mark. It is no point saying that there are hundreds of DPPs in the Attorney-General's Chambers when most of them are not able to undertake complex, complicated and time- consuming cases. The AG has to strengthen and streamline the prosecution service with a greater emphasis on specialisation. The AG as head of the legal service also needs to touch on the concept of having specialist judges to expedite cases. Presently, numerous cases drag on for months and years before a verdict is reached, not to mention further appeals as the accused in criminal cases and litigants in civil cases strongly feel that judgments could be wrong or incorrect. Many want to take the gamble or risk of getting a more definitive judgment on appeal especially hoping for an over-ruling of the case, reduction in costs or sentence. There have been cases concerning corruption where the accused was hale and hearty when the case was first mentioned but had become wheelchair bound due to old age or sickness when the case was finally disposed of by the Court of Appeal or the Federal Court. This leads to a backlog of cases and delays in disposing of cases. Having specialist judges at the Sessions and High Courts will improve both the quality of judgment as well as expedite cases. The present-day world is one of specialisation and the Malaysian legal and judicial services will benefit immensely from it. As said in the interview by the AG, law reform is his equally high priority. The Pakatan Harapan government has stated that there is a wide range of laws that need to be annulled, amended, re-cast or reformed as well as new laws introduced in line with international best practices. However, there appears to be no urgency to reform or draft new laws as pointed out by the AG who said that various government departments and stakeholders are dragging their feet on the matter. For example, the Harapan politicians and even the state governments of Selangor and Penang during their tenure between 2008 and 2018 were clamouring and crowing their heads off for local government elections and even the AG then represented the Penang state government cause for the introduction of municipal elections against the federal government’s prohibition. Now that the Harapan has become the federal government, one hardly hears a whimper about this important issue. Often one hears of statements by ministers that only mayoral elections could be held in the near future. What is the point in having mayoral elections when the whole local government needs to be reformed through elections to make it responsive, responsible and efficient not to mention corruption-free as local authorities collectively spend billions of ringgit of taxpayers and rate-payers money nationwide? The local authorities are one of the main epicentres of corruption, abuse of power and waste of money in the country. Only local polls can put an end to this malaise. The Housing and local government Minister Zuraida Kamaruddin should direct the ministry to quickly draft a new law that enables local polls to be held. Whatever it is, the new law has to be quickly drafted. The AG needs to look into setting up panels or committees to expedite the process if the departments are adopting delaying and indifferent tactics. Reforming or introducing new laws should be the main task of this government and with its parliamentary majority it will not be difficult as many of the laws that need to be reformed or introduced are also supported by some opposition members. Additionally, MPs can also play a more meaningful role by introducing private member’s bills to aid in the process. Some of the most important legislation worldwide have come from private member’s legislation such as the abolition of the death penalty in Britain in 1965. Harapan MPs need to make the best use of the present legislative opportunities for issues they champion. The AG also needs to look into reasons why Malaysia has not ratified a number of international treaties and conventions concerning the UN that will improve the nation’s stature in the international community. The OSA, which appears to be sacrosanct with the present government too, needs to be reformed as it is the epicentre of corruption and abuse of power in the country. All corrupt deals, lopsided contracts and agreements are also classified as secret and confidential and known only to the elite to the exclusion of the public and even the MPs. The OSA in its present form needs to be reformed, if not abolished altogether, to create a corrupt-free nation. All in all, the AG has his hands full with a wide array of pressing legal and legislative duties and responsibilities for the next two years - an exciting and challenging time presented to no other AG in the history of the country and thereby creating a strong personal legacy. To paraphrase Sir Winston Churchill, no other AG has been tasked to do so much within so short a time.